THE HAGUE, Netherlands — Former Bosnian Serb military chief Ratko Mladić has once again found a way to delay his trial in which he has been charged with 11 counts of genocide, war crimes and crimes against humanity for the 1995 Srebrenica massacre of 8,000 Bosnian Muslims. Upon the conclusion of his current adjudication, he is scheduled to be tried for ordering other Serbian atrocities throughout Bosnia’s 1992-95 war that left 100,000 dead. On 12 June 2012, Mladić was rushed from The Hague courtroom to a hospital after complaining of feeling unwell. After several delays the first witnesses just began to testify this week in against the 70-year-old former general, which makes his sudden illness suspicious and to outward appearances cowardly. Apparently, the Butcher of Bosnia had the stomach to order his troops to commit mass murder while he watched, but seems unable to face the verbal accusations of his accusers. Though he was sent to the hospital as a precautionary measure, the accommodations that he has and is yet receiving does not seem warranted given the heinous nature of his crimes, especially since his victims were not afforded the luxury of having their executions delayed. Presiding Judge Alphon Orie suspended the trial and called for a medic after Mladić held his head down and ran his hands through his hair while complaining of feeling ill. Remarkably, he was able to “compose himself” as he was taken from the court to the hospital for tests. Mladić evaded capture for 16 years until his arrest in Serbia last year. He has since undergone minor surgery for a hernia and has suffered from other ailments such as kidney stones and pneumonia which are common given his advanced age. The reticence of the court to continue with the proceedings because of Mladić’s claims of illness is understandable given its prior experience in the trial of Former Yugoslav President Slobodan Milosevic who died of a heart attack in his cell in 2006. His death resulted in a premature end to his genocide case. However, justice and closure for Mladić's victims is far more pressing and should be given equal weight when deciding to postpone his trial yet again. If even a hint of subterfuge on his part is suspected, and though it is politically incorrect, sometimes death during due process can bring a sense of closure that delayed justice cannot. Will Ratko Mladić Escape Justice? THE HAGUE – It is unfortunate for the survivors of victims of the 1995 Srebrenica siege that resulted in the genocide of 8,000 Bosnian Muslim men and boys must continue to wait for justice. 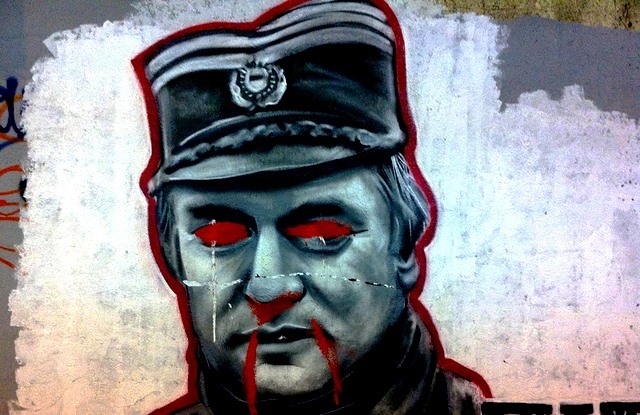 The aforementioned atrocities occurred under the leadership of Ratko Mladić, former Bosnian Serb military commander. Mladić stands accused of directing the men under his command to shoot Muslim boys and men. 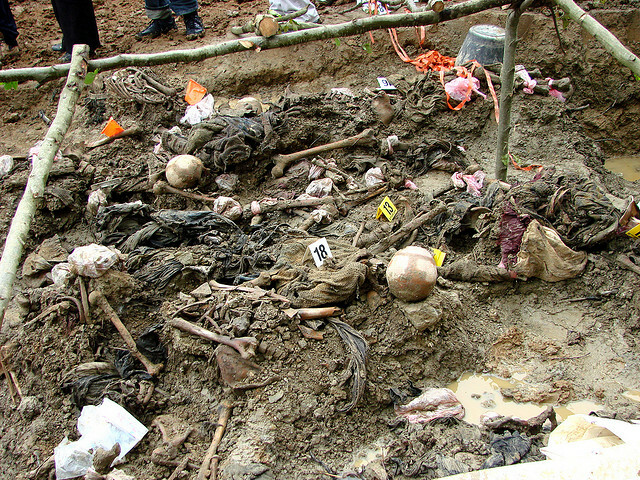 Many of these premeditated murders occurred at the edge of mass graves so that the victims' bodies easily toppled into gigantic holes, some of which they had dug for themselves at gunpoint. These atrocities recall to memory some of massacres that occurred in Europe during World War II. At the start of the trial the prosecutors explained in excruciating details the horror that his victims felt and the bodily injuries they suffered at the time of their deaths. Photos of the victims were also on display. Mladić, 70, is a shadow of his former self, but his arrogance and defiance has not dimmed in the intervening years. He has demonstrated no remorse and during the trial has displayed frequent incidents of joviality and represented insouciance and disdain for the proceedings. Technical errors were given as the reason for the continuance of Mladić’s trial. Specifically, the prosecution reviewed a voluminous amount of evidentiary documents to determine which should be disclosed to Mladić’s defense team. Apparently, from the millions of documents reviewed, and the thousands provided to his defense team, it was discovered that several thousand more “pages were not accurately uploaded when they were sent,” according to Frederick Swinnen, advisor to the prosecution. Swinnen claimed that this was an honest error that was recently discovered and that corrective action is underway. This brings scant comfort to the victims who expected the first witnesses to deliver their testimony at the end of this month, 29 May 2012. This mistake cost the prosecution dearly as the defense is seeking six months more to prepare and review all the documents required to mount a defense on Mladić’s behalf. Prior to this discovery, they had requested and been denied a three month extension. This is not the first time that Mladić has been on trial. As we previously reported, he was brought up on charges of genocide before the International Criminal Tribunal for the former Yugoslavia, a United Nations court, which has already sentenced more than 60 defendants from the Balkan wars. The defendants in this trial, including Mladić, stood accused of orchestrating the ethnic cleansing that result in the deaths or expulsion of non-Serbians from Bosnia. Most of the women and girls were deported, but the men were not allowed to leave with them. Over 8,000 men who remained behind were summarily massacred upon Mladić’s orders. On 26 May 2011, Serbian security forces arrested Mladić in Lazarevo, Serbia. He had eluded apprehension for 16 years despite a large monetary award for his capture. He has been indicted on 11 counts of charges including war crimes, crimes against humanity and two counts of genocide. The defense entered a plea of not guilty despite video tape footage of Mladić leading the men under his command on a 44-month siege of Sarajevo, in which 10,000 people died. Mladić claims that he was not their commander and that he did not authorize the ethnic cleansing measures that resulted in the death of so many Muslim men. He attributed the carnage to mercenaries and radical fringe groups whose nationalism erupted and resulted in the expulsion and murder of the Serbian Muslims. However, a July 11th video clearly refuted his claims of innocence. In the footage Mladić in his general’s uniform entered a deserted Srebrenica on foot, urging soldiers to advance and congratulating them. During the next 5 days, the ethnic cleansing campaign continued despite global outcry and in the end those not fortunate enough to have escape were buried in mass graves or their bodies left to rot in the deserted streets. We hope that justice delayed does not result in justice denied for this would be the greatest tragedy of all. On 26 May 2011, Serbian security forces arrested Ratko Mladić in Lazarevo, Serbia. He had eluded apprehension for 16 years despite a large monetary award for his capture. In 1995 after fleeing and subsequently going into hiding, Mladić was indicted by the International Criminal Tribunal (ICTY) off genocide, war crimes and crimes against humanity. In October 2010, Serbia intensified the hunt and with the financial support of the United States increased the reward for Mladić's capture from €5 million to 10 million euros. Thus, he became one of Europe's most wanted fugitives. As a consequence of his ability to elude capture for over a decade the Serbia government asked Interpol to assistance them in the apprehension of Mladić. His capture was considered a precondition for Serbia to join the European Union. The arrest has been widely hailed as a huge success for Serbia and its Westward-leaning president, Boris Tadic. Mr. Tadic declared that the arrest had “closed one chapter of our recent history that will bring us one step closer to full reconciliation in the region” and that Serbia had “wiped the stain” away. Mladić's most unconscionable act was the notorious Srebrenica massacre in which 8,000 Bosnian Muslim men and boys were killed by the Army of the Republika Srpska, VRS under his command. He is also charged with crimes related to the VRS' siege of Sarajevo, which lasted more than 1,400 days and resulted in the deaths of around 10,000 civilians, with a further 56,000 wounded.